Battery Grip commonly used for shooting of portrait photography because the camera needs to be held at 90 degree rotated. The name battery grip says what it is even one is not aware. But there are practical questions like when to have battery grip for DSLR camera, Which brand battery grip is good, what are the advantages and disadvantages of having a battery grip. The things which supply power to your digital camera must be either from the camera manufacturer or equivalent good company. A bad quality battery grip is a meaningless purchase and also can push your camera’s circuit towards destruction, at least will look or feel bad. You can buy by asking same model camera users but we can not officially recommend. Battery grips from the manufacturers cost around $300. Third party battery grip starts from $30. Battery grip is an accessory of DSLR and other digital cameras. The accessory allows to hold multiple batteries of the camera supports or other type of batteries. Essentially it extends the battery life of the camera and at the same time adds a vertical grip. Battery Grip for DSLR cameras has a compartment to hold two batteries plus usually an extra Shutter Release Button on the grip’s body plus it modify the centre of gravity, adds weight, increases dimension of the camera. There are battery grips which supports ordinary AA batteries. Clearly, way to use common type of AA batteries is a big advantage when there is no way to charge the camera’s battery. Sometimes there are more buttons than shutter release. If you have bigger hand like me, then it is an advantage provided that you already purchased the more important accessories for DSLR. It is meaningless to buy a battery grip but lack proper lenses or tripod or monopod. Disadvantage is the cost the camera manufacturers sells the battery grips. If the thing came free of cost with DSLR camera package, all of us would use it. Not liking and keeping it separate it not exactly any disadvantage. This Article Has Been Shared 7961 Times! Here Are DSLR Focus Tips To Get Sharper Images. There is no way to correct the focus afterwards in any software unlike the other parameters. After Buying Leica M or DSLR, We Should Feel Like Miser. Here is How To On DIY 360-Degree Camera With DSLR, Rangefinder Camera With Existing. DSLR Viewfinder Using Guide Explains How To Viewfinder Perfectly. Surprising Amount of Information & Control Available Through The Viewfinder. 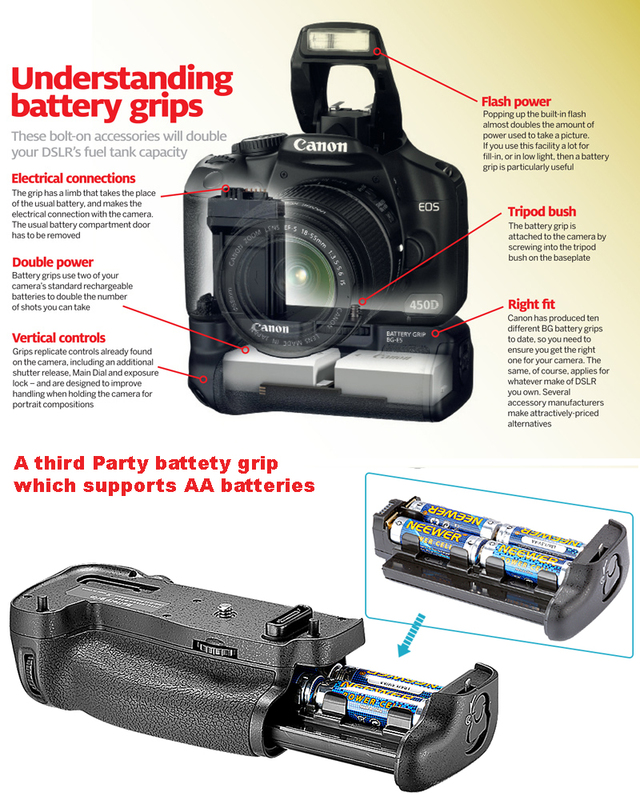 Cite this article as: Abhishek Ghosh, "Battery Grip For DSLR Camera : Advantages and Disadvantages," in The Customize Windows, June 13, 2017, April 21, 2019, https://thecustomizewindows.com/2017/06/battery-grip-for-dslr-camera-advantages-disadvantages/.